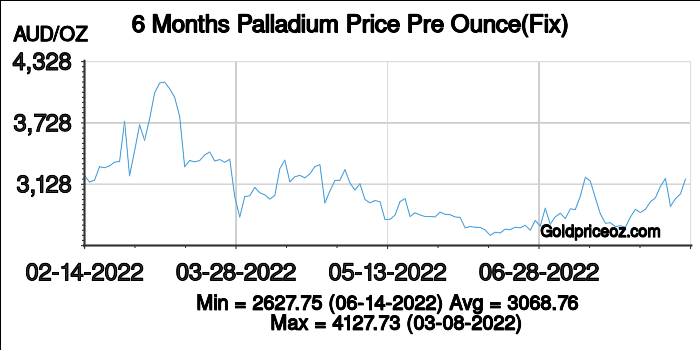 Palladium price in Australia in Australian Dollar(AUD) per ounce is a free service provided by Palladium Price OZ website, where shows current palladium price(including bid price and ask price) and palladium price history chart(London palladium fixing price). 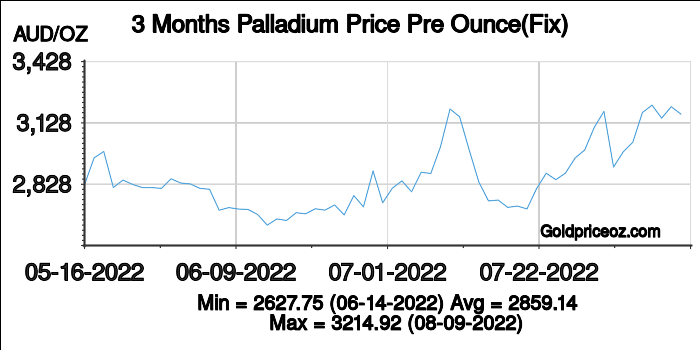 Palladium price in Australia per ounce today is being updated once every 1 minutes. Since the modern gold rush in the 1970s and 1980s, gold has consistently been one of Australia's major exports. Gold export was Australia's third ranked export commodity in 2010. 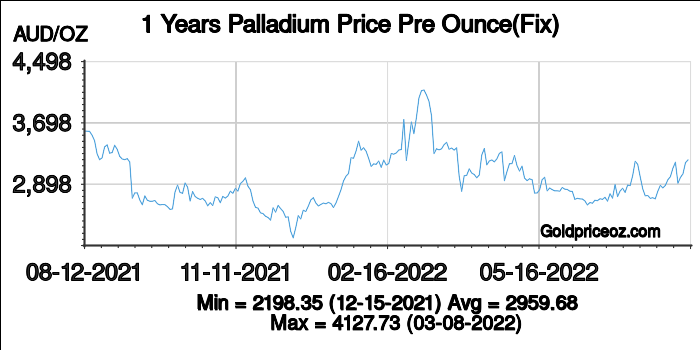 The Australian gold exports some countries which have strong demand for jewellery, such as India; some require gold for financial purposes, such as UK and China; some have demand for using in industrial applications. Australia is the second largest gold producer, just after China. 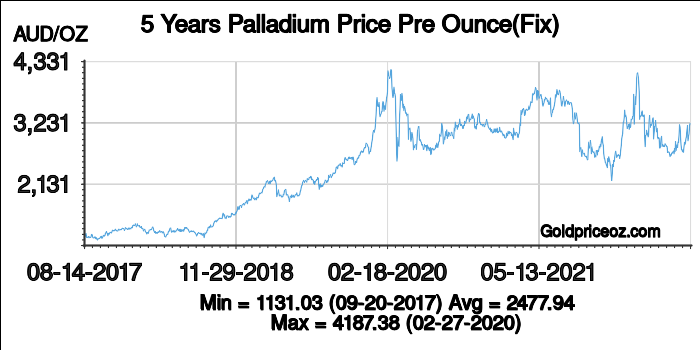 The gold is throughout across the nation, however, about two-thirds of its gold production is from the state of Western Australia. Its official gold holdings are 79.9 tons. The Australian Securities Exchange (ASX) is the Australia's major securities exchange. It headquartered in Sydney, Australia. In July 2006, Australian Securities Exchange was created by the merger of the Sydney Futures Exchange and the Australian Stock Exchange. Now, it is one of the world's top-10 listed exchange groups, comparable to the New York Stock Exchange, London Stock Exchange and Deutsche Bourse. The ASX provides futures, options, ETFs, equities, warrants and REITs, among other securities. 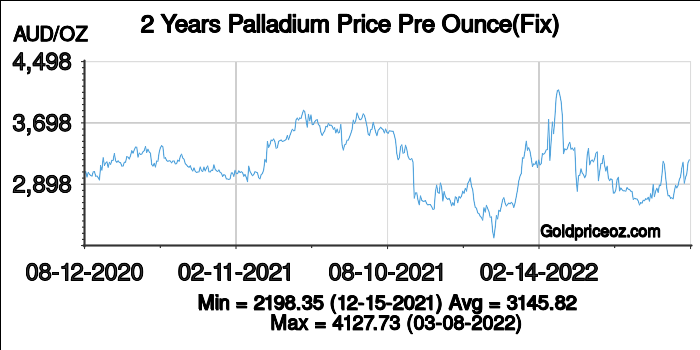 The gold products include gold ETFs, gold structured product, and gold shares. Current holidays: Good Friday, Easter Monday, Anzac day (25 April), Queen's birthday (June) and Christmas Day (25 December) and New Year's Day (31 December).